No one can stop the forward moving of time. Luckily, it doesn’t necessarily mean that you can’t slow it down as well as its various effects on the mind and body. The human race is fortunate enough to be blessed with so many age-defying gifts from nature, and they come in the form of herbs and spices. Their consumption or addition to food allows you to decelerate aging and minimize its impact on you. Many of these potent anti-aging solutions are also available in various forms such as capsules, tinctures, teas and powders. 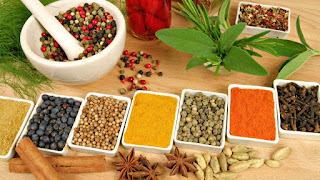 Continue reading to know some herbs and spices known to be very good at delaying aging. This spice is a potent remedy for an assortment of health problems for its antimicrobial and anti-inflammatory properties. It supports liver functioning for better elimination of toxins and improved production of antioxidants that kill off age-accelerating free radicals. Turmeric is also known to help you lose weight. Having lovely skin is one of the secrets to looking young. Milk thistle is an herb known to help the liver produce more antioxidants that protect the cells from free radicals as well as promote skin that glows with health. Nothing can age you faster than free radicals, so it’s important to keep the levels of your body’s antioxidants high. Swallowing 2 to 3 raw cloves of garlic a day or simply adding it to food can help slow down aging. Garlic is revered for its ability to lower hypertension, thin the blood and kill off microbes. Because it is packed with sulfur, garlic is very good at keeping the gut healthy and the joints pain-free. The intake of ginseng helps you stay younger in a couple of ways. First, it helps alleviate stress which can accelerate the aging process. Second, ginseng helps you become physically active so you may get your regular dose of exercise. Exercising helps in keeping your skin from sagging by toning the muscles. Other than making pastas and soups taste phenomenal, rosemary also helps you look young. This aromatic herb helps in keeping the skin hydrated, thus preventing fine lines and wrinkles from showing up. Rosemary safeguarda the skin from toxins, and it’s also known to stimulate the production of collagen, a structural protein. Free radicals accelerate aging so you should do your best in keeping excess ones at bay if you want to stay looking and feeling young. One of the herbs known to have excellent free radical-fighting properties is grape seed. This herb helps neutralize free radicals that cause the skin to age and make the joints achy and inflamed.